Did you know that there’s a right way and a wrong way to keep your teeth clean in between your dental visits? Do you know how often you should be visiting the dentist to ensure that your gum health is in proper condition and free of any oral disease? According to recent surveys, nearly a quarter of Americans have gone two or more days without brushing their teeth in the past year. While this may not seem significant, oral bacteria goes to work on your tooth enamel the moment it enters your mouth. So, here’s a quick check-in from your dentist in Lynnfield to help you confirm you’re doing all you can to protect your mouth from disease. 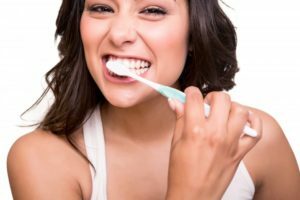 What Does Proper Brushing Consist Of? Did you know that you only need to use a pea-sized amount of toothpaste to get your mouth thoroughly clean? Using any more is not only a waste of toothpaste but may even wear down tooth enamel. The American Dental Association recommends that you brush for at least two minutes a day, twice a day, and use a fluoridated toothpaste while you do it. Start by brushing the front surface of your teeth using a circular motion. Then, switch to brushing the four corners of your mouth, holding your brush at a 45-degree angle towards your teeth. Use short, back-and-forth strokes and make sure to reach molars. These teeth are the most susceptible to cavities. Avoid brushing too hard as this can wear down tooth enamel. Don’t brush for longer than 3 minutes. Not only does brushing longer not remove more plaque, it can also wear down tooth enamel. Remember to brush your tongue at the end! Why Should Flossing Always Be a Part of Your Routine? Flossing helps you remove plaque and oral bacteria from the areas of your mouth that your toothbrush can’t reach. Even if you buy an interdental toothbrush, the bristles won’t be thin enough to reach the deep pockets of your gums nor the sides of your teeth. When flossing, use at least 12 to 18 inches of floss so you can wrap enough around your fingers. When sliding the floss in between teeth, notice if it struggles to fit or if it tears while in use. You made need to adjust the thickness of the floss if you find this difficult. Be sure not to snap the floss out of your teeth as flossing too hard can also damage enamel. According to your dentist in Lynnfield, you need to visit him every six months for cleanings and exams to maintain proper oral health. Keep in mind that your dentist doesn’t just look for cavities and clean your teeth during your visit. Your dentist is also looking for early signs of gum disease, which is incredibly important to treat early when found. He’s also looking for abnormalities in your mouth that could be a sign of oral cancer. Again, prevention and early treatment are always the focus during your regular exams, so don’t skip them. Looking for more preventive tips on oral care? Schedule an appointment with your dentist today to get all your questions answered! Dr. Rob Schumacher has been practicing for over 14 years and is showing no signs of slowing down. One of his favorite aspects of being a dentist is helping patients achieve a better sense of oral health and wellbeing. That’s why he’s giving you easy tips to improve your at-home care. To learn more about this topic or ask questions, contact him at (781) 334-3400 or visit his website.